Artist Wayne Perry with tacos and drink, posing in front of Trouble in Paradise. When walking down 1st Street, people of all backgrounds often stop and marvel at the murals that artists and residents have created over the years. The paint and aerosol plastered against the walls often speak to the needs of the neighborhood’s residents, demanding that tourists and elected officials alike open their eyes to injustices facing the community. The murals located outside of Self Help Graphics & Art are some of the most eye-catching among these artworks. One wall in particular, is filled with iconography pulling from several aspects of Chicano culture, especially as it relates to Boyle Heights and East Los Angeles. Spotted on the upper left-hand side of the mural is, artist and SHG Board Member, Wayne Perry’s painting of the “buffalo soldier”. It is an homage to mixed-race people like himself. The buffalo soldier depicts the five-century old narrative surrounding people of half-indigenous/ half-African ancestry. It resonates with Wayne who is also of mixed ancestry, half-black and half-Mexican. Growing up in the 1970 and 80’s in Boyle Heights, Perry found his Mexican identity always in question. Though having a black father and Mexican mother was never a problem for him, he found that it was for others. Nevertheless, growing up in a predominately Mexican neighborhood has inspired much of his work. His mother’s knack for drawing exposed him to art and influenced him to take up art at an early age. Though he didn’t know of any art schools or professional artists growing up, he ended up at the Craft and Folk Museum after leaving Otis College of Art & Design when they suspended the ceramics program. Wayne figured his artistic skills could be best honed there. It was during this time that Wayne found his way to Self-Help Graphics. He made it by as an artist doing ceramic work on murals in pre-gentrified Echo Park, alongside SHG legacies such as Frank Romero, Margaret Garcia, Else Flores and Diane Gamboa. Now, decades later, with the Annual Print Fair & Exhibition on view through August 3rd at SHG, collectors, artists, and community members can see the fruit of his labor in his newest print, “Trouble In Paradise”. 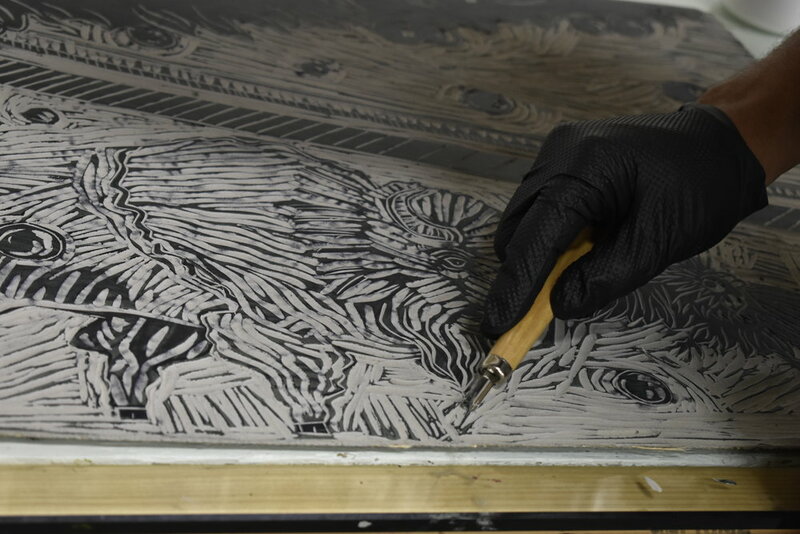 Artist Wayne Perry carving out the linoleum block for his print Trouble in Paradise. “Trouble in Paradise” perfectly encapsulates the theme of displacement in black and brown communities as a result of gentrification. The orange tree, located at the top of the print, amidst the deterioration of an urban neighborhood showcases the contradicting ideals and realities of life in Los Angeles. There’s an image of Southern California as a hub for glitz and glamour that counters the reality of turmoil caused by displacement. In reference to recent construction taking place, Perry places the 6th Street Bridge in the center. The piece invites audiences to think critically about the turmoil and disorder inflicted on low-income individuals and families, as well as unaffordable housing and incompetent urban planning. With what is left of the ever-changing Latino community in Boyle Heights, Wayne Perry uses SHG’s resources as tools for creating social justice through art. “SHG gives a voice to a generation of young artists to make a change,” said Perry. Savanna Morgan is a Self Help Graphics & Art Intern from The University of Notre Dame. Artist River Garza Pays Homage to His Tongva Maritime Culture in "Breath of the Ocean"